If you're reading this, then this course is for you. You've demonstrated the main criterion: some degree of interest in the subject matter of the course. You might be thinking: this course looks too difficult, too technical, or too high level. This will be true for everyone, even me. But the course is structured so you can focus on what's interesting and accessible for you, and you can ignore the rest. Read on... you'll see what I mean. I'm designing the course so that each week is one of these self-contained topics. This topic can then be approached from different directions, at different levels. The content is a starting point. I will provide a series of reflections. But I will be learning about each of these topics along with everyone else. My objective is to make it so that these topics are not over anyone's head. It's a bit difficult; each week is the very tip of an abyss; I find myself drowning in it almost every day (today, for example, discovering a new technology I had never heard of, and failing to make a Google application work the way I want it to). But I'm hopeful; and people will be learning with me. Here is the course outline. I encourage you to add your comments and suggestions. This course is not like a typical online course or MOOC where you have to sign in to a learning management system or learning platform. You don't 'register' for the course; you follow the course, and the way you follow the course is to a large degree up to you. A number of different technologies will be deployed, and you should find the combination of technologies that works best for you. - The course tag is #el30 and you can follow this tag by searching for it on either Twitter or Mastodon. I will use this tag to make announcements from my @Downes Twitter and Mastodon accounts. Other people are encouraged to use the tag to comment on any aspect of the course, point to resources, discuss with each other, or whatever. - Webcasts will be broadcast using (probably) YouTube Live, so you can follow along with talks or interviews with featured guests, or wait and watch the videos later. We might use some prerecorded video, but I really prefer live video. Audio recordings will also be provided. - Your own personal website or blogging application - if you use WordPress, Blogger, Tumbler or whatever (there are many choices, and we'll talk about them) you can create your own course content. You are encouraged to create your own course content. This content will be aggregated by the course website and shared in the email newsletter and RSS feed so everyone can read it. We'll help you with this. - Your own gRSShopper Personal Learning Environment. This is experimental technology and definitely not for everybody. That said, for those who are interested, you can explore some of the topics in this course using technology that actually uses them (keeping in mind that it might not always work - remember, I'm learning along with all of you). Each week we will be looking at different topics, and so the activities in the course will be specific to that topic. This means that over the ten weeks of the course you may be experimenting with a variety of different tools and creating content of different types, for different purposes. For example, in one of the weeks the topic is 'community'. The issues look daunting - we're looking at consensus and the 50%+1 problem, theories of consensus, truth and post-truth. But we address these issues every day in very practical ways. For example, consider the case of the Wikipedia community. It meets these challenges with every single article. So one activity you can try involves working with Wikipedia to assess end edit an article. Another way of looking at community is to look at how it makes decisions. There are applications that create forums for discussion and voting. So course participants may wish to spend the week creating an issue to debate in one of these applications and trying to come to a consensus. Can this be done? But here is the key: while I and my course guests will be able to facilitate some of these activities, we cannot facilitate them all. Nor should we. So I will be actively recruiting people throughout the course to contribute and lead these activities. There will be a mechanism very similar to the assignment bank used in Jim Groom's DS-106 courses. Where possible, I would like to showcase these creations; these are the new media of the future of E-Learning. If you are using gRSShopper, you can use these to create a portfolio for the course. If you are using your own blog application you can create posts linking to these activities. Or you can just make them and forget them. It's up to you. It's a bit of a cliché, but it's true, that what you get out of this course will depend entirely on what you put into it. You can choose how to participate, and participate as much or as little as you want, and what you will learn is proportional to that effort. The content of the course is merely a starting point. If you watch and read the content then you will acquire a basic level of understanding of the topics. But the real knowledge you can learn is new knowledge that didn't exist before this course. It is the knowledge that you and the other co-participants in the course (including me) actually create while wrestling with the different aspects of the course. It's hard to predict what that will be, because it doesn't exist yet, and depends on everyone in the course. I am hoping that people engaged in the course will come out of it with a different perspective on learning and educational technology. I'm hoping that this different perspective gives them a new and more powerful way to understand how we are shaping the future with new technologies, institutions and cultures. I am also hoping some participants will acquire new technical skills using tools that might have been new to them, and new ways to use these in the day-to-day world of teaching and learning. There are no tests, and no certificates. Though maybe we'll create some badges - who knows? This is the section where I describe my background and why I think it important to offer this course. My formal education and degrees are in philosophy, I am a former newspaper editor and journalist, I have studied computer technologies for the last 40 years, and I have worked as an instructional designer and learning technology specialist for two universities, one college, and for the last 17 years, for the National Research Council of Canada. While at Assiniboine Community College I built a learning management system and with the University of Alberta I built learning and resources online community called MuniMall. 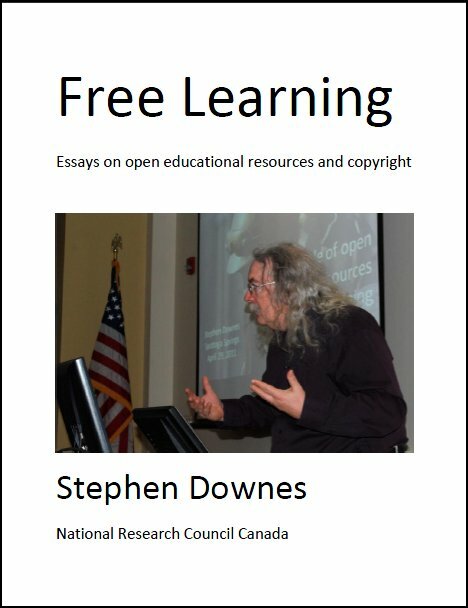 I was the world's first educational blogger, back in the 1990s, the originator of the concept of E-Learning 2.0, and with my colleague George Siemens a co-developer of connectivism ('a learning theory for the digital age') and the developer of the world's first MOOC. You can read more about me on my personal website and follow my research by subscribing to my daily newsletter, OLDaily (which I have published since 2001). I've written a lot of articles over the years and presented in something like 35 countries on every continent except Antarctica (and I'd go there in a heartbeat). I want to offer this course now not because I'm an expert in all of these topics and thing that everyone should know what I know. I'm not that expert - and I don't think anyone is an expert in all these things (though there are certainly experts far more qualified than me in each of them). But I know enough, I think, that I can point a group of interested people in the right direction, ask the right questions, and maybe try the right things so that we, as a community, can come to understand all of these a bit more. And it's important that we as a community - and here I refer to scholars and educators around the world - actually do come to understand these a bit more. We have already seen how dramatically the internet has changed our society, and how dramatically the second wave of social networks and chatbots has changed it yet again. What I see coming - and what I've called E-Learning 3.0 - is a series of changes of equal significance, and I think we should be prepared. Views Today: 37 Total: 447. Last Updated: Sept 20, 2018 11:55 a.m.